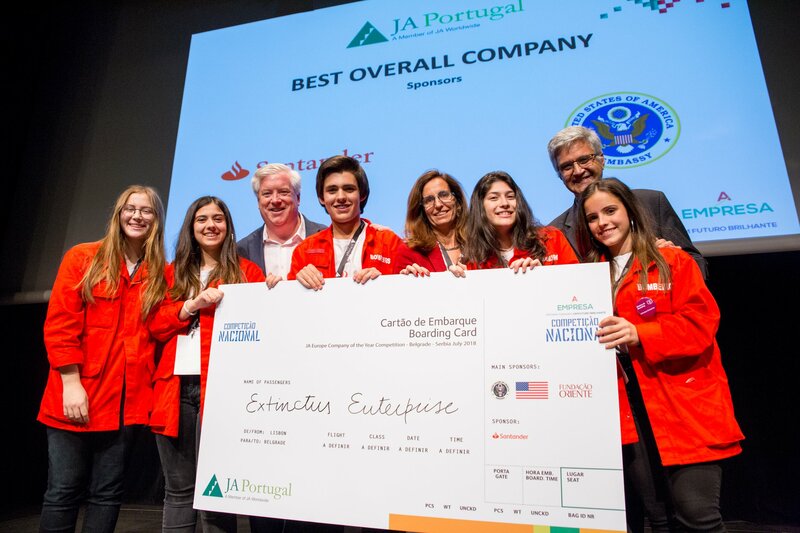 A team of students from CLIB – Colégio Luso Internacional de Braga recently won the 11th National Competition, promoted by Junior Achievement Portugal, the Portuguese chapter of the oldest organization in the world promoting education for entrepreneurship. The five 10th graders – four girls and one boy -, mentored by INLer João Piteira, will represent Portugal in the European Competition, that will take place next 16th to 19th of July in Belgrade, Serbia, with the mini-company “Extinctus Enterprise”. This project was inspired by the response to the tragic forest fires that hit Portugal in 2017. The technology prototype, developed with INL support, is an underground Ignis Capsule containing a radio, a battery and a temperature sensor. In case of fire, it detects the heat and sends a signal to firefighters. Another CLIB team – also from the 10th grade – mentored by INLers Dmitri Petrovykh, Cláudia Sousa and Eurico Moreira, got the second place in the same competition with the SOS – Seniors On Surveillance project, for developing the concept of a high-tech Safelet bracelet equipped with alert buttons and sensors to promote independence, autonomy and safety for senior citizens. In addition to the technical mentoring, INLer Francisco Guimarães helped this team with advice on the business plan development. According to Dmitri Petrovykh, “it was gratifying to work with these students. Their projects exemplify creative applications of technology to link and combine business and social responsibility considerations”. Carolina Domingues, leader of the SOS Team, emphasized the benefits of working on the project with INL mentors. “It was a vibrant experience, and we learned a lot of things that we had no idea about when we started. We also loved INL team members who were always very supportive, while challenging us to apply what we have learned”. The Junior Achievement Portugal National Competition final involved 130 students from all around the country.